24 VOLT SOLENOIDS. Buy quality Auto and Marine Electric Parts and Accessories online, Sydney. 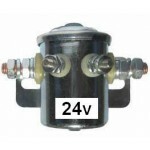 SSC24VContinuous Duty Solenoid 24volt100 amp rating with copper contacts 2 front contact posts fo..